Instead of harassing Bishop Fellay to sign a doctrinal preamble, the Vatican should require every superior, university president and ordinary to sign the above quoted statement to remain in office. I sense there would be quite a few vacancies as a result! First, the Holy See is hardly “harassing” Bp. Fellay to sign the Doctrinal Preamble. But I do like the idea proposed. If the SSPX has to make some sort of Adhesio Fidei, then let’s have everyone make one if they have some office or position in the Church or her institutions! I remember when I was in seminary in 80′s and the Holy See determined that seminary faculty would have to take an oath which involved little more than the Creed, one prof, a rather unstable and less than intelligent heretic actually burst into tears in front of our class and raved about “the Kremlin on the Tiber”. Thanks be to God, those days are pretty much over now. If Benedict XVI really wants to foster restoration of the Church from the post-Conciliar crisis he should simply accept the SSPX’s beautiful declaration of Faith and unilaterally declare the Society in communion with the Church and on his own authority grant to them jurisdiction directly from himself throughout the world to continue their work. That may sound impossible but recall that the Society has just offered up a twelve-million rosary crusade for the Church. Nothing is impossible for God and He can refuse no request of His Blessed Mother. Of course it is not impossible. The Supreme Pontiff has complete and universal jurisdiction. I, too, would rejoice if the Pope simply did that and resolved the situation. But he isn’t going to do that. Pope’s don’t submit to renegades. For all of their solid doctrinal statements and their zeal for souls, they don’t obey the Roman Pontiff whose authority they say they uphold. 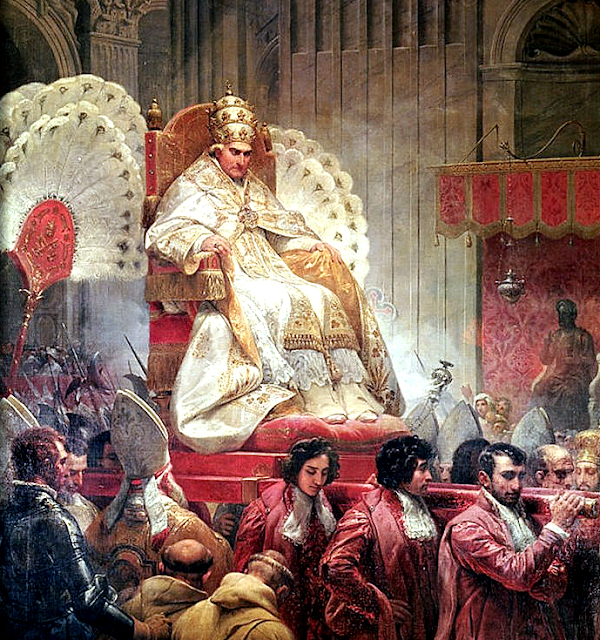 What I would like to see, and I think Benedict would like to see, a demonstration that the bishops and priests of the SSPX will actually submit to his authority and obey him and those to whom he gives his own authority in the Roman Congregations and work with local bishops who are tasked with the pastoral governance of dioceses. Here’s my proposal. Let’s set all the Preambles and Declarations aside for a moment. For the beginning of the Year of Faith, let the SSPX, the whole shootin’ match, gather en masse in Rome. Let them ask for an audience with the Holy Father. Let them – one by one – kneel before the Pope. With their folded hands between Holy Father’s hands as if at an ordination, let each one of them promise to obey him and his successors. I’ll be that would do it. Of course on my planet, they would then go in solemn procession into the Basilica of St. Peter, with the Roman Pontiff raised on the sedia gestatoria, and celebrate Pontifical Mass, the SSPXers serving, their choir showing the Sistina how its done, etc. When I worked in an office of the Holy See I heard stories from the old timers about how when the Pope’s secretary would phone, saying that the Pope was coming on the line, they would kneel down just to take his phone call. I remember watching how, during an audience with John Paul II, the great Msgr. Luigi de Magistris knelt down the moment the Pope entered the room and would not rise until the Pope raised him. Yes. Kneel down before the Vicar of Christ and promise to obey him. I would.